During my trip to Ortigia, I saw many beautiful things and ate many dishes that were so delicious I wanted to Tweet/IG/FB about them immediately. However, one of my goals during my vacation was to slow down. I wanted to focus on what I was seeing, doing, eating at that moment. I did occasionally post a picture on social media but cut way back. My friend, Erica, is also a Sicily fan and we decided to highlight a few things we love about this incredible island for seven days. You can following Erica on Instagram HERE. First up is the Duomo. 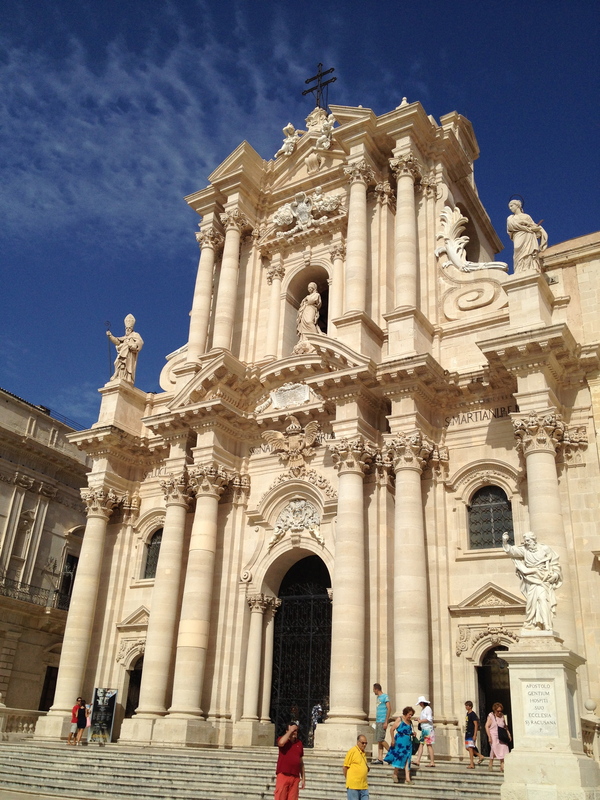 I arrived in Ortigia during the early afternoon. After unpacking, and picking up some essential groceries, I walked over to the Duomo. Many friends have described the Duomo and its piazza as one of their favorites in all of Italy. Yet, I was still floored by her beauty, color, and presence. It is truly one of the most magnificent buildings I have ever seen. 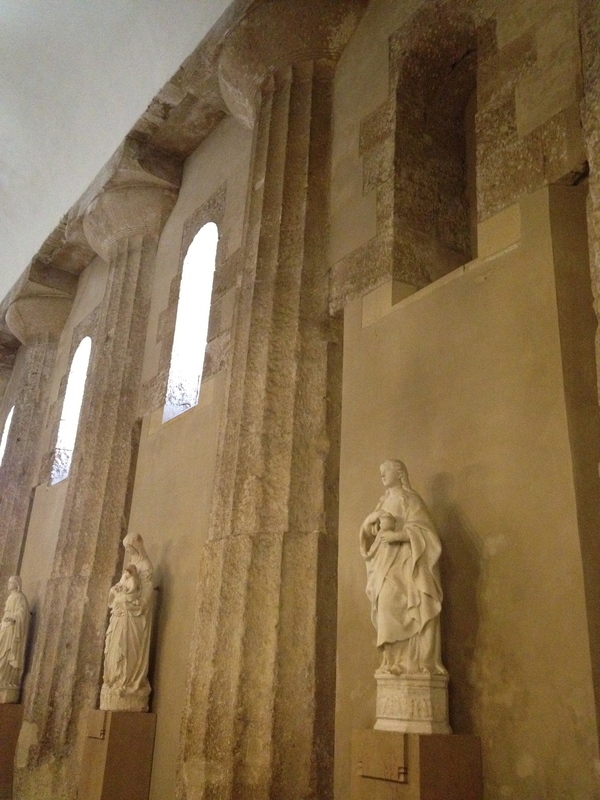 As with other regions of Italy, the layers of history in Sicily run deep. 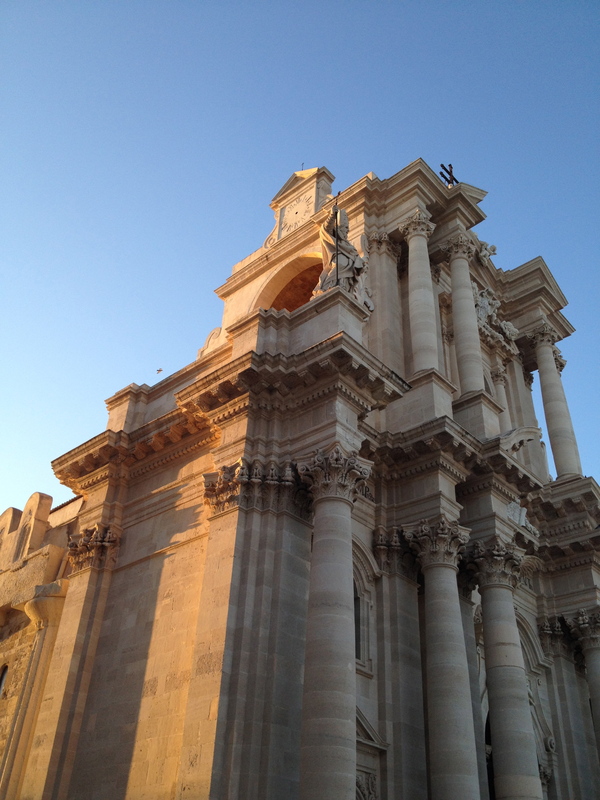 Siracusa was one of greatest and important cities in the Greek empire. This dramatic cathedral was built in and around a 5th Century BC Doric Temple to Athena. Doric columns are visible inside and outside the church. 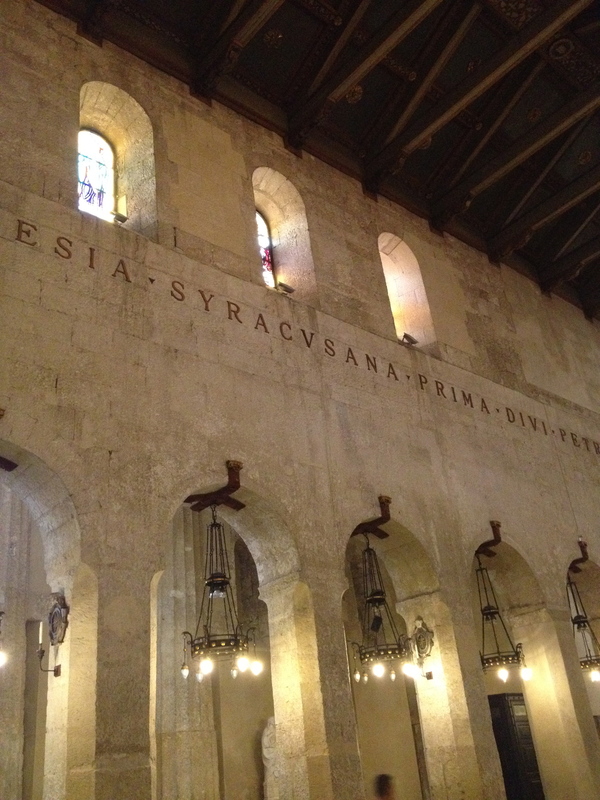 In the 800s it was converted into a mosque by the Arabs who conquered Sicily. Then the Byzantines returned to power, only to be defeated by the Arabs again. They ruled until the Normans defeated them in 1085. The Baroque facade was added after the devastating earthquake of 1693. Somehow this very ornate style sits in perfect harmony with the Greek lines and aesthetics of the earlier structure. I made it a point to see this building every single day. 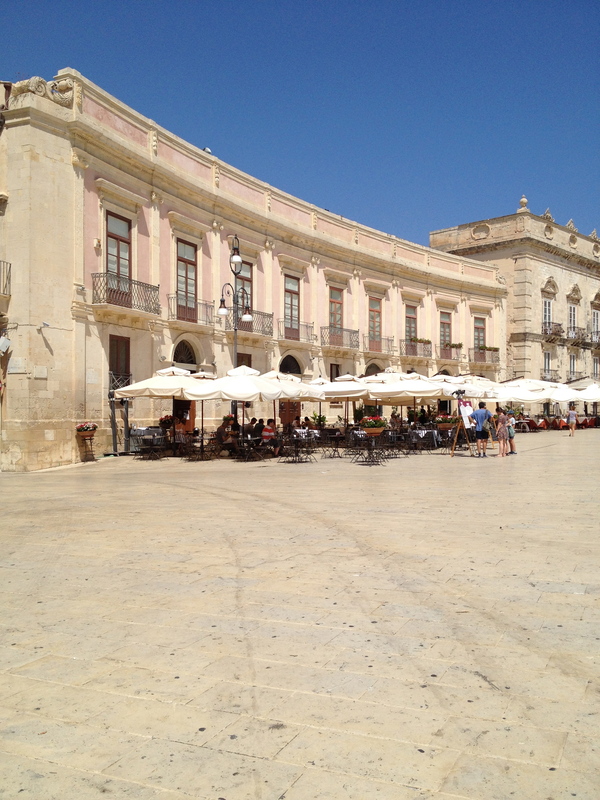 This piazza is a perfect place to relax as the sun goes down and the locals start their passeggiata. Beautiful photos! 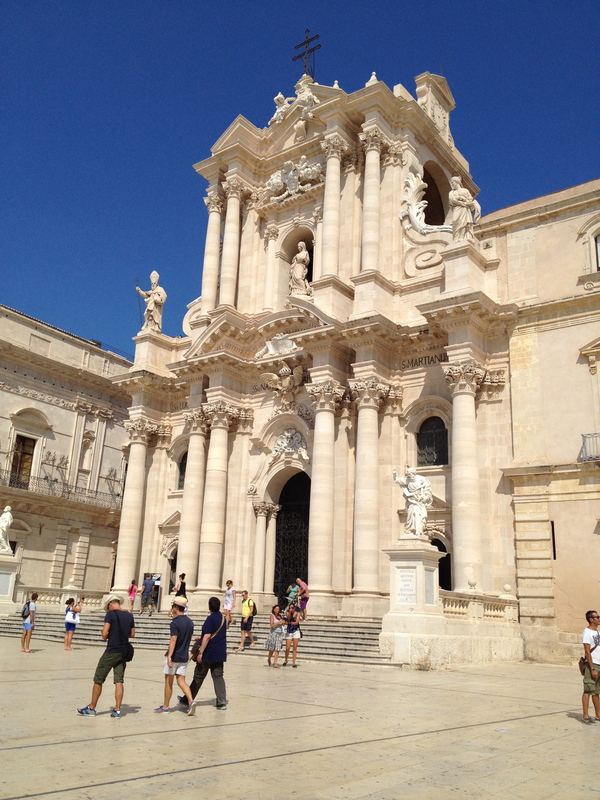 Makes me want to go back to Ortigia soon. Especially since they’ve so obviously cleaned the facade since the last time I was there. Thank you! It’s really something to see while the sun is setting. The stone, the light, the architecture. It’s almost too much. Sicily, so full of beauty! Yes, so true. I hope to explore the west coast and the interior soon. You and your iPhone sure have produced some very beautiful photos! As usual for Italy the streets are sooo clean. Thanks for sharing. 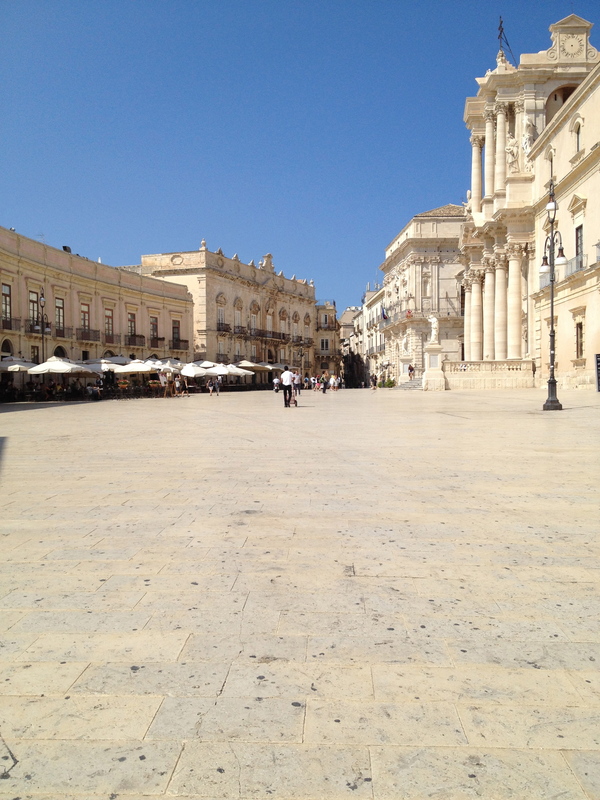 Given how many people are in the piazza daily, I was impressed by how often the city cleaned it. I will not speak about streets in Rome.